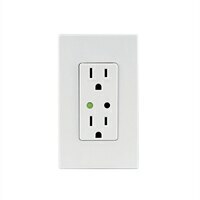 The Leviton DZR15 is a Z-Wave enabled 15 A tamper-resistant receptacle, designed for use for residential lighting and motor applications. A large range of load types are supported, including incandescent, halogen and magnetic low voltage, electronic low voltage, fluorescent, and motor loads up to 1/2 horse power. The DZR15 is fully compatible with the Wink hub and SmartThings hub, as well as all other certified Z-Wave controllers.